After the landslide 66-3 victory over Savannah State at home last Saturday, the Troy football team has turned its head to a road test tonight at 6:30 p.m. in its first conference game against Arkansas State. Last year, the Trojans came up short to the Red Wolves in Troy 41-34, a game that left a bad taste to many associated with the program. However, this season in two games, Troy has accumulated an average of 50 points per game compared to Arkansas State’s 35.5, and, on defense, the Trojans have already achieved seven sacks in part to Jadarius Garner, who was named the Sun Belt Conference Defensive Player of the week. Against the Tigers Saturday, the junior defensive end punished Savannah State’s anemic offense to the tune of two sacks, three tackles-for-loss, and two forced fumbles while leading the Trojans with a team-high seven total tackles. Troy will need confidence when they face a 1-1 Arkansas State team, who will prove a tougher match than the Trojans’ last opponent. “We’ve got our work cut out for us,” Blakeney said. In the Red Wolves’ opening game of the season against Arkansas Pine-Bluff, Arkansas State took its home opener 62-11, but the lopsided opening win was dampened by a 38-9 loss on the road to Auburn. In this game, Coach Blakeney has the attitude of all hands on deck to ensure victory. “A guy that can help us win, we are going to find him a spot on the roster and on the bus,” Blakeney said. One of the key players to keep an eye on in the third game of the season is senior quarterback Corey Robinson, who is quietly having a statistically scary season. Named the AT&T All-American Player of the Week after the UAB win, Robinson has completed 47 of 51 passes for 499 yards and five touchdowns with no interceptions in the first two games of the season. Another impact player on the offensive side of the ball for the Trojans is Robinson’s favorite target Eric Thomas, who has eight catches for 135 yards and four touchdowns. 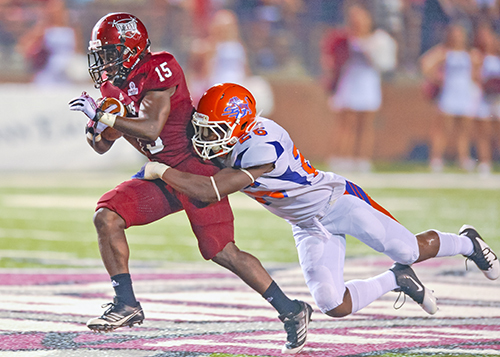 In the Savannah State game last weekend, Thomas had three catches, all of which resulted in touchdowns. Tonight’s third game of the year against the Red Wolves, which is televised on ESPNU, could be viewed as an important game that can dictate Troy’s season moving forward from a momentum standpoint with Mississippi State waiting for the Trojans the following week.